I try to donate to 7,000 Bracelets for Hope a few times a year. They are a great organization with the goal to donate bracelets to the mothers of children with rare genetic disorders. To do so they are always looking for designers willing to donate blue bracelets to their cause. I think that it is a great cause and I have sent out four different bracelets so far. This is the latest that I have come up with and I have one more that is in the process of being finished. This one was made with glass beads and pewter flower links. It is rather lightweight and just fun to wear. I love this bracelet! 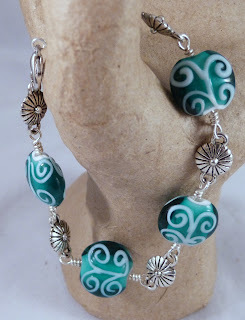 the style and the beads are wonderful :-) i am sure the mother who receives it will love it!